Power passing splitter. It’s another one of those terms you will hear about if you spend enough time around antennas and satellite dishes. It’s not a truly accurate term… what is usually meant is “all ports power-passing splitter.” Some splitters only pass power on one port and some don’t pass on any port. Let’s dig into the controversy. What does power-passing mean anyway? There’s a funny property of that center conductor inside a coaxial cable. The RF part, the part that gives you video and audio, actually travels on the outside of the cable. That’s called “the skin effect.” The inside of the cable doesn’t do much of anything. That’s why cheaper cables use a coating of copper over a steel center. Why not? So, someone figured out that the center of the wire wasn’t being used for much of anything and thought, “how about I use that to send power up the wire?” It’s true, you can do it (as long as the cable is solid copper) and it works great, because DC power travels all the way through the wire and doesn’t affect the RF stuff dancing around the outside. Why would I ever want to power anything through the cable? Because you have to power it some way. Satellite dishes with built-in multiswitches need power. So do antenna amplifiers. There are a lot of cases where you need to get power outside and it’s kind of a drag (not to mention potentially dangerous) to run power out there. So sending power up that wire is a good, safe idea. There’s only one problem. OK Mr. Wizard, what’s the problem? The problem is that a well-made splitter will have a DC Block to keep stray power surges from going up the line. What about power coming down the line? Hopefully your dish or antenna is properly grounded so you don’t worry about that. In order to make sure you can pass power up the line from a power inserter located inside, you need a power passing splitter. Wow you make that sound enticing. Tell me more. Some splitters, like the one you see here, pass power through one port only, usually labeled in red. The center of the connector might also be red. You must have the power inserter connected to that port. If you connect it to one of the other ports, it won’t do anything because the other ports have DC blocks in them. On the other hand, splitters like the one shown at the top of the article have all ports set to pass power. That’s important. Ooooh, I can’t wait for you to tell me how important and why. OK, it’s not like national security important. But it is important. 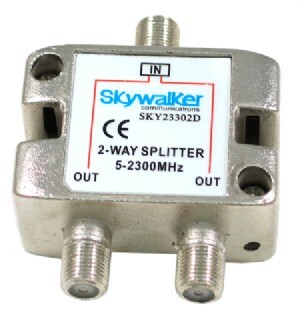 If you are using two multiswitches to get more tuners in your satellite system, each one is capable of passing power to the dish. If you use a splitter that passes power on all ports, there are two important benefits. The first is that if the power is interrupted from one source, the dish can still work. This means that if you’re running a large installation, you don’t lose TV in all rooms just because one switch goes down. The other is that electricity is a funny thing. It acts a lot like water. Water wants to find its own level and it all wants to be moving the same speed. Electricity is like that. If you have power on one port and not on the other then you could potentially run into issues with an unbalanced signal getting to the dish or amplifier. NICE AND EASY: What is a panel antenna?